Courtesy Internet2 and the New World Symphony. Internet2's LOLA technology united distant musicians from North Carolina and Florida, creating a realtime music accompaniment for a compelling experimental film. Internet2's musical collaboration technology LOLA takes art collaboration to new heights. Musicians from North Carolina and Florida bring life to student composition. 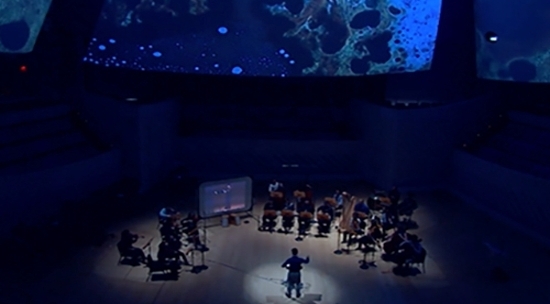 Realtime musical performance dovetails with evocative visuals for immersive theater experience. Spring concertos often take place in outdoor amphitheaters where nature and music entwine to elevate each other, carrying audiences to another plane. Internet2 and the New World Symphony evoke this immersive experience in ONE, an experimental short film depicting the journey from chaos to harmony. The twist: The orchestra is performing in Miami, Florida, joined by a violin soloist over 800 miles away in Greensboro, North Carolina and an online audience across the nation. A backdrop of immersive visuals plays like the inside of a listener's mind, drawing dark connections between architecture, music, and nature but ultimately emerging into expansive imagery awash in light and color. Internet2's high speed network and LoLa (Low Latency audio and video conferencing) technology bring it all together. LOLA enables real-time, simultaneous, live musical performances across long distances. This technology is made possible by the Internet2 Innovation Platform, a 100 gigabit network connecting advanced research and education networks. "As artists explore genres at the intersection with advanced networking, ONE was another resounding success," says Ann Doyle, community engagement manager at Internet2. "Just as the film journey was evocative and ultimately a triumph of the human spirit, so too was the use of LOLA and Internet2 a triumph. Mike Ladouceur's vision and production suggest we can look forward to a bright future of innovation in this realm." Co-commissioned by Internet2 and The New World Symphony, ONE is an experimental short film that draws connections between architectural patterns, musical figures and natural disorder in a search for harmony. The performance took place in Miami, Florida. Violinist Fabian Lopez performed via LOLA from more than 800 miles away. Courtesy Internet2 and the New World Symphony.